This is the first post in a series about how to get started appreciating good coffee and preparing it at home. Before you go out and buy equipment or spend a lot on coffee, the first step is to know what a good cup of coffee can taste like. Without experience and even with good equipment you’re not likely to get a good result at home and may get frustrated and quit. The best way to taste good coffee is from a professional barista. This will be easier if you live in an urban or suburban area. There’s fantastic coffee in Seattle, Portland, New York and Los Angeles, but you can also find delicious coffee in Indianapolis, Arkansas and Wisconsin. It just may take a bit more searching and a little luck. It is important to find the right type of cafe. Going to Starbucks or your local diner1 and ordering a straight black coffee may be the end of this experiment for you. So don’t do that. How Do You Know What Makes a Good Cafe? Find a “third wave coffee” cafe in your area. It’s not an official term, and you won’t find that many shops calling themselves that, but it’s as close as we’re going to get. For lack of a better definition, third wave means “they care about how the coffee beans are grown, roasted and brewed.” Coffee farming is a very labor-intensive process, and most coffee farmers earn next to nothing for their hard work. Part of this “third wave” has been increasing the sustainability of coffee farming and paying fair wages to farmers, but that’s a topic for another post. Google “third wave coffee in ” and see what comes up. Whenever I travel to a new place, one of my favorite things to do is try new cafes, and this is exactly what I do. There’s usually at least one if you’re in a decent sized city2. Leave a comment with your city if you’re having trouble and I’d be happy to make a recommendation. Do they roast their own beans? Awesome, they may be a great place to try assuming they roast light3 and provide information on the region the beans are from4. You are in luck because a good local roaster is hard to beat. 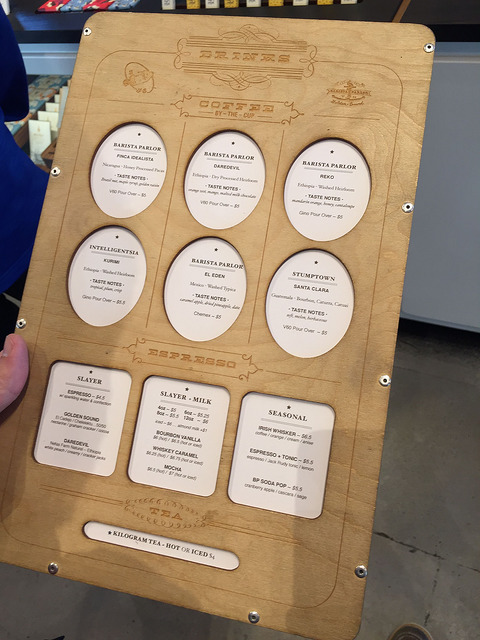 Their menu is primarily focused on the basics, espresso, americano, cappuccino, and filter coffee. You want to start with filter coffee, but it’s good to know that they know their basics. The menu is light on the basics in favor of things like raspberry banana mocha and dreamsicle latte. Your barista can’t answer any questions about the coffee they are serving. If you really have no options for good cafes in your area, try finding a friend who enjoys good coffee and ask them to make you a cup. Once you’ve found a good cafe, go in and order a black coffee to stay. A paper cup is going to be a different experience than a hot mug. Drip is fine but go for a pour over if you feel like it, just don’t get too fancy. Pour over is a general term for any one of many manual brew methods. It will be more expensive, but likely tastier. It could also be terrible, depending on the cafe, so drip is a safer choice to start. If they can tell you the tasting notes for the coffee (they should) just go for something that you would like. Do not put cream and sugar in it! I am not going to lecture you on putting cream and sugar in your coffee, as much as I’d like to. However, it will defeat the purpose of learning to enjoy good coffee as you will taste the cream and the sugar, and we’re not trying to learn how to make dessert. Don’t just slam it back either. Let it cool slightly, and really focus on tasting the coffee. Try and pick out what flavors you taste. Most likely you’ll say “it tastes like coffee” and that’s fine. You may hate it. That’s OK too. It’s just one cup, and it’s possible this specific choice just wasn’t the coffee for you. Whether you liked it or not, try another coffee there and at another cafe, if possible. Go with a friend and you can each get a different coffee to try and share. If you continue to strike out it may be that coffee really isn’t your thing, and that’s fine but now you know. It is an acquired taste. Just like wine, or whiskey or beer, each coffee has its own unique taste. Think of your cafe trip like a wine tasting. No one is visiting a vineyard with tiny bottle of hazelnut creamer up their sleeve and pouring it into their cabernet. You are there to taste the unique aspects of this coffee. And though you may not recognize it at first, your coffee does have unique aspects, you just need to train your palate to recognize them. If you did enjoy it, now you’ve had a taste for what good coffee can be. Keep exploring different types of coffee and preparation methods and find which ones you prefer. Knowing what kinds of coffee you like will make good coffee prep at home much easier. I do have to warn you though, once you’ve had really great coffee, it’s very hard to go back to an inferior version. This may happen to you, and you may never be able to drink gas station coffee, or the dirty brown water in your office breakroom again. This really is OK though, because my recommended approach to learning to make coffee is very portable and you can make it nearly anywhere. If you’d like get into coffee drinking, training your palate is the most important step, because it is how you will determine if you are making the right choices in your coffee preparation. That’s when it really starts to get fun and you find out which coffees you really enjoy. So even if you’re “ruined” forever by good coffee, you now have a whole world of coffee to explore. Stay tuned for upcoming posts on how to taste and evaluate coffee and how to get started making great coffee at home.